A newsagent in County Donegal has sold his second winning lottery ticket in a matter of weeks. 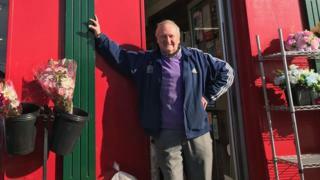 James Barclay, who owns the lucky shop in Raphoe, sold Saturday night's winning ticket for Lotto Plus 1 worth €1m (£860,000). Mr Barclay also sold a local man a winning ticket worth €500,000 (£431,000) in February. The National Lottery has asked people in Donegal to check their tickets. The winning numbers were: 8, 11, 16, 18, 20, 46 and bonus number 40. Fourteen millionaires have now been created since changes were made to the Lotto last September. "This is great news," Mr Barclay said. "We can't believe it." "This is a very small town and to have sold a Lotto Plus 1 and a EuroMillions Plus winning ticket within a few months is brilliant," he added. Mr Barclay said there is a lot of passing traffic through the town, especially at weekends, so the winner could be anybody. "The rep rang me to tell me. Everyone that comes into the shop now I tell them to check their tickets. "We are only six miles from the border and get a lot of visitors so who knows. Whoever it is we are thrilled for them. "I don't know what the secret is. Maybe my shop is lucky."